If you are a taxpayer and a non-accountant at that, finding the right materials online for tax decision making is sometimes futile effort, often the search results doesn’t fit in Philippines setting. 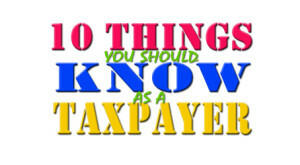 Here’s the 10 things you should know as a Taxpayer. Whereas human rights are guaranteed in the Philippine Constitution, the National Internal Revenue Code likewise guarantees the rights of taxpayers. Among these are their right to protest an assessment and the right to be given reasonable time to present documents. To supplement these rights, Senator Ralph Recto has filed Senate Bill No. 718 to protect taxpayers from harassment and humiliation. As a taxpayer, you may lobby congress for the passage of this Bill. Tax evasion and tax avoidance are two different acts. While tax evasion may land you in jail, tax avoidance can save you because it means undertaking all “legal” means necessary to avoid paying taxes. You can do this by applying for tax exemptions by citing all applicable laws where you may qualify, or spend your money on matters which are tax deductible. If you are rich enough, you may invest your funds in countries considered tax havens. Just a reminder, make sure that what you do are, I repeat, legal. If you are an employee receiving purely compensation income, you are exempt from paying income tax. But then, you must watch out for your income to not exceed the amount allowed by law. If your combined 13th month pay, bonuses and other benefits exceeds P30,000 in a taxable year, you cannot be considered a MWE anymore. Therefore, your income for that year becomes taxable. In this case, your employer takes care of the job by deducting from your salary the right tax amount and remitting the same to the BIR. Further readings can be viewed here. As a consumer, you purchase everything you need fuel, food and other supplies. The Value Added Tax (VAT) is “inclusive” in the price of all items you pay for, except for few basic goods which are VAT exempt such as agricultural products in their original state. The 12% VAT is fully shouldered by consumer being the end-user of the products. So the next time you eat in a restaurant even a burger joint or buy some groceries, remember that you are paying taxes. Further readings on VAT can be found here. The BIR is offering Informer’s Reward to anyone who is instrumental in the discovery of tax code violations. Through the information you submit, the subject person shall be audited and make him pay for the deficiencies and any internal revenue tax liabilities computed afterwards. The reward would be a sum equivalent to 10% of the amount recovered or 1 million pesos, whichever is lower for every case. Further information can be found here and the related issuance can be read here. How would the tax agency know how much you earn? For employees, it is as easy as requiring your employer/s to submit the list of all their employees together with the information on how much they earn and the taxes withheld. For self-employed individuals such as businessmen and professionals, it’s a collaborative effort. Through the use of computer technology, data are gathered from all the people who hired you or the people you have had transactions with. So next time you buy an expensive car or mansion, be on guard and make sure that you can explain where the money comes from. It is nice to know that income from kidnapping, carnapping, smuggling, or drug dealing is not among those listed as exempted from income tax in the tax code. Keep in mind Al Capone. It is ironic how he successfully avoided prosecution for all the crimes that he committed but was finally put into jail for tax evasion. So, the lesson here is to declare all your income including those acquired through illegal means. You don’t know when the tax agency will knock on your door. Republic Act No. 9994 otherwise known as the Expanded Senior Citizens Act of 2010 granted additional benefits for Senior Citizens. Among the privileges granted under this Act is the twenty percent (20%) discount and exemption from value -added tax (VAT) on the sale to senior citizens of various goods and services from all establishments. This includes purchase of medicines, medical and dental services, transportation fare and payment to recreational facilities. Payment for funeral and burial services for senior citizens is also included. If you are an income-earning individual, having a qualified dependent may make you pay less income tax compared to those persons without dependent and earning the same amount as you do. A qualified dependent can be your child or children (legitimate or illegitimate), 21 years old and below (beyond 21 years old is qualified provided that he/she is physically and/or mentally incapacitated), not gainfully employed, and dependent upon you as parent for chief support. Your brothers, sisters, parents or any relatives are not qualified dependents for taxation purposes. You may deduct from your taxable income an amount of P25,000 for every qualified dependent child up to a maximum of 4 children. So if you are married (personal exemption for each married individual: 50,000) and have 4 qualified dependent children (additional exemption: 25,000 x 4 = 100,000), a total amount of P150,000 can be deducted from your gross income to get your taxable income before computing for your income tax due. Remember that the father can always declare the dependents unless the father decides to waive his right to claim the deductions in favor of his wife (if both are working). Splitting the dependents is not allowed nor double claim of dependents by both husband and wife. Here’s a scenario: a woman who had a son out of wedlock who marries another man. Can the man claim the son of the woman as dependent? if you know the answer, post it in the comment area. The BIR has recently joined social media community to re-enforce tax awareness. It aims to connect to netizens who could be business people, consumers, professionals, employees or just curious learners. The fan pages will feature the latest news and update on tax policies, campaign, programs, tax reminders among others. To get tax updates, subscribe to BIR Fan Pages. Let’s support the tax agency in reaching out to all taxpayers, a noble gesture of contributing to Philippine progress.